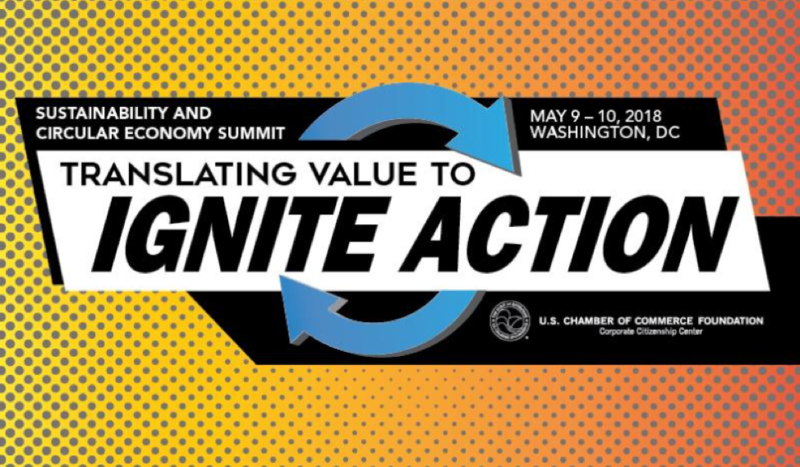 The theme of this year’s Sustainability and Circular Economy Summit was Translating Value to Ignite Action. Convened earlier this month by the US Chamber of Commerce Foundation, the Summit explored how to effectively implement sustainability strategies for businesses and their material throughput in the economy—what has (and hasn’t) worked, what trends are emerging around these issues, and how to communicate the value of sustainability and circularity as a business strategy to a wide array of business units and consumers. Communities and markets throughout the world, impoverished in decades prior, are now stepping into the middle class. Accompanying this increase in prosperity is increased consumption. The economic growth is building upon a planet already strained to maintain current levels of human consumption. 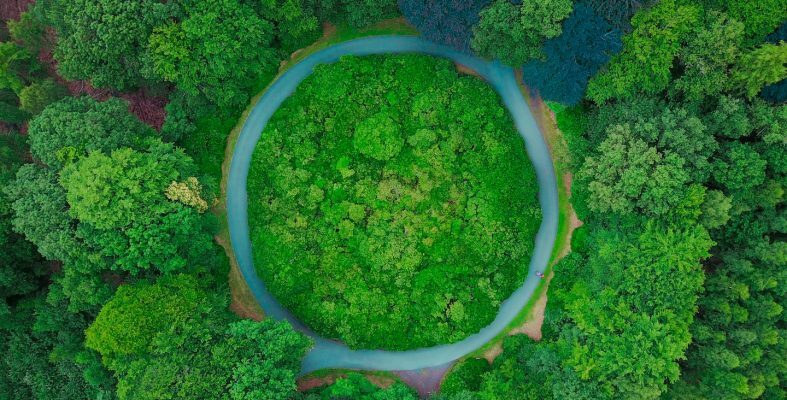 With the world population estimated to reach 9 billion by 2050, large-scale circular economy strategies can help mitigate humanity’s footprint against the constraints of the Earth’s finite resources. 1. Begin with the end in mind. The circular economy isn’t always a perfect circle. Reusing, recycling, or repurposing products extends the lifecycle of materials, yet ultimately those materials still create leakage in the form of waste byproducts. Begin with the end in mind. Think about end of life during the early product design stage. There are transformational initiatives to create products out of waste. Adidas, for example, sold 1 million pairs of sneakers made from ocean waste in 2017 and is now introducing a line of recycled clothing and taking steps to become even more sustainable. “We need to think more about the end of life of materials in the front end of design,” pointed out Emily Tipaldo, Director of Plastics Packaging and Consumer Products at the American Chemistry Council during a session on packaging. Factoring the end product stages in the early design phase not only influences its attributes and marketing channels—it also informs where the product ends up at the end of a traditional lifecycle. 2. “It’s complicated.” With the growing amount of waste threatening the regenerative capacity of the Earth’s ecosystems, it is natural human instinct to respond with easy fixes, such as a call to “get rid of all plastics” or “recycle everything.” Complex environmental and social challenges, however, often require strategic solutions grounded in a systems approach. As Tipaldo noted, “We need to be mindful not to throw the baby out with the bathwater. It is important to understand the implications of various types of waste management, rather than saying something is universally good or bad.” Simple solutions can have unforeseen consequences. Without an understanding of these consequences, a solution can be equally damaging as the originating issue. With the growing amount of waste threatening the regenerative capacity of the Earth’s ecosystems, it is natural human instinct to respond with easy fixes, such as a call to ‘get rid of all plastics’ or ‘recycle everything.’ Complex environmental and social challenges, however, often require strategic solutions grounded in a systems approach. 3. Educate Your Counterparts Continually. Missy Owens, Director of Government Relations, Federal and Diplomatic at The Coca-Cola Company and Jennifer Ballen, Global Manager for Packaging Sustainability and Circular Economy at Anheuser-Busch each shared how they are tackling the challenges and opportunities to collaborate with counterparts throughout their company—departments working to meet aggressive targets, who may be unfamiliar with sustainability as an integrated function of business operations. Both Owens and Ballen emphasized the need to demonstrate the value of sustainability as a cross-functional agenda across corporate divisions and departments. “Things are changing,” said Ballen, who advised, “Use data to break long held myths about the value of sustainability in marketing, for example. We’re seeing more integration.” Anheuser-Busch has set aggressive waste management targets. By 2025, the business wants 100 percent of purchased electricity to come from renewable sources, and it wants all packaging to either be returnable or made from majority recycled content.To achieve such bold targets requires a level of disruption. Ballen’s team has gone so far as to create “The Packaging Manifesto,” a doctrine designed to educate commercial teams on the business value of sustainability and highlight these efforts directly in marketing outreach. Make sustainability an aspiration—something your consumers and stakeholders want to feel good about being a part of. The majority of people want to have the problem solved, but they don’t want to get into a heated debate—or feel guilty about it. As an example, Cindy Ortega, SVP and Chief Sustainability Officer at MGM Resorts International shared how MGM has discovered a way to transform potential food waste in their operations into nutritious meals for Southern Nevada’s homeless population. The program expects to divert 1 million pounds of food by 2020 to feed the hungry. Yet it is tough to communicate this worthy effort in a way that is relevant and motivating to Las Vegas visitors who are looking to take a break from the challenges of daily life. “Because social issues can be complex, and solving them can be amorphous, you want to create a clear target, something that gives the consumer something they can do—something they can fix,” shared Williams. She suggested a simple, yet powerful message, “Let’s end hunger together,” providing consumers with a basic, yet aspirational social contract of one tangible action a consumer can do, with the benefit of becoming part of something much larger than any one person and gaining the good will feeling that she or he has helped another. The closing speaker, Lockheed Martin’s SVP of Internal Audit, Ethics and Sustainability, Leo MacKay Jr., concluded the Summit with a call to the American business community to take individual and collective responsibility for the sake of current and future generations “Citizenship is about stepping forward as a member of American industry.” Decision-makers in business have a new lens through which to interpret corporate goals and responsibility. It’s a responsibility, but it also makes business sense. A circular economy makes sense because when products are designed to remain valuable when their useful life has ended, everyone benefits.